HOUSTON (KTRK) -- A trip to the Louisiana casinos ended with a nasty surprise for more than a dozen bus riders. 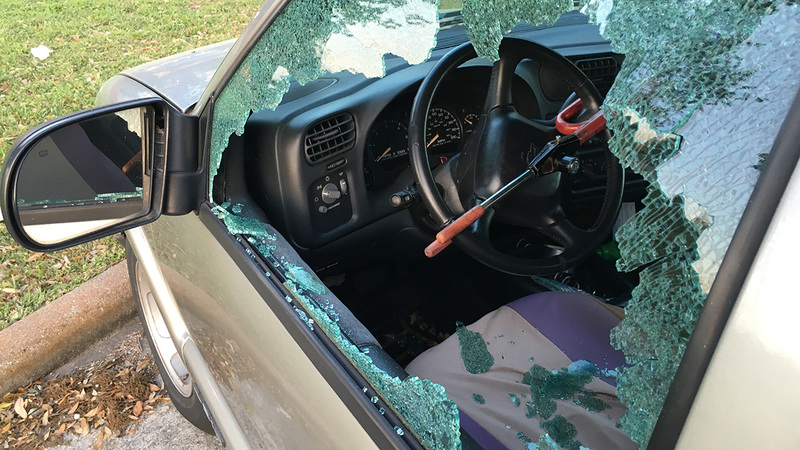 Their cars were broken into as they sat in a southeast Houston parking lot. The car burglaries happened on Woodridge near the 610 Loop and I-45. "They broke into the front and the trunk of the cart and they took everything and threw it all out," victim John Barber said. "Lost a lot of valuable stuff out the trunk of the car. I had a little taste of money in there to put in the bank, which I should have went today." Barber's car was one of more than a dozen vandalized in the lot. Greatland Tours uses the lot as a pick up location for trips to Louisiana. Sarah Williams was shocked to see the damage left behind. "They just sick, I don't know what to say now," Williams said. One driver told us he has been using this lot for years and this is the first time cars have been broken into. Houston police did come out to take a report of the damage but were not much help to those with broken windows. "Wish we would have caught them. God don't like ugly though, he don't, he don't," victim Roosevelt Simpson said. Even with the damage left behind we found drivers willing park here anyway, but others decided to use a different lot and leave the gambling to the casino.